Ford’s Theatre revives the 1954 teleplay that became a hit 1957 movie about 12 jurors deliberating a murder case. See it now through Feb. 17. WASHINGTON — In 1957, “12 Angry Men” gave Henry Fonda an iconic role and Sidney Lumet his directorial debut in one of Hollywood’s most revered movies, ranked by experts among the American Film Institute’s Top 100 movies and by fans as No. 5 all time in the IMDB poll. Its one-room setting makes it perfect for the stage at Ford’s Theatre now through Feb. 17. Based on the 1954 teleplay by Reginald Rose, the plot follows the heated deliberation of eight jurors weighing the evidence in the case of a 16-year-old boy accused of murdering his father. Russotto plays the bullheaded Juror No. 3, who’s leading the charge toward a guilty verdict. “From the way the case is presented, the evidence makes him appear guilty,” Russotto said. King plays Juror No. 8, the loan holdout suggesting that there might be reasonable doubt. The conversation involves issues of race and class reflected in the formal vs. casual wardrobe. Beyond personal prejudices, the cramped setting ramps up the irritability late on a Friday. “Some people want to get out of the room because it’s hot,” Russotto said. Creating this cramped space is the job of scenic designer Stephanie Kerley Schwartz. Thus, the audience feels locked in with them, save for an intermission between the two acts. “We don’t have the restroom conversations that take place in the film, so we’re on stage the entire time and, to some degree, the audience is held captive the same way we are,” King said. 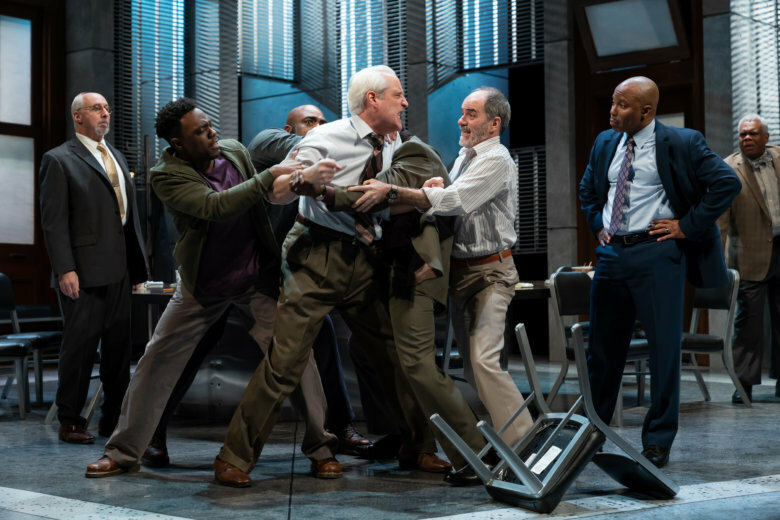 While audiences experience the drama in real time, the actors have put hours of foresight into its creation, thanks to Epps’ painstaking rehearsal process in the run-up to the play. That rehearsal included plenty of time to sit and talk outside of their characters. Now, it’s your turn to bring your assumptions and weigh the evidence for a killer night out.